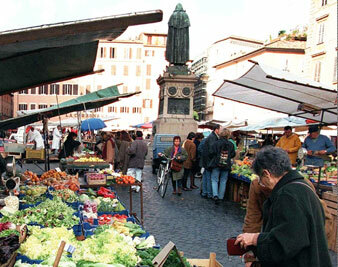 In the heart of Campo de’ Fiori, one of Rome’s oldest marketplaces, stands a statue of a solemnly hooded figure. Wrists bound, a book clasped in his right hand, his face virtually obscured by his cowl, he interjects a melancholy and reflective note into the otherwise irrepressible atmosphere of this famous piazza. Looking more closely, we see the philosopher Giordano Bruno, who died in this piazza on February 17, 1600, as his admirers wanted us to see him when they erected this statue, with the support of Rome’s city council, on June 9, 1889–as Italy’s most famous heretic after Galileo, a figure transformed into a political and intellectual icon by a young and radicalized Italian nation, which proclaimed its political secularism and liberalism, and recent acquisition of Rome, in plain view of the Vatican. The historian John Bossy once described Bruno as Italy’s Joan of Arc. This is an apt metaphor, up to a point. Bruno did indeed become a martyr to his beliefs, though his battles were fought with words rather than arms. His death, however, was of his own choosing, and it was a choice he came to in the course of his lengthy trial at the hands of the Roman Inquisition, not far from where Bernini’s elephant now sits beneath the obelisk in Piazza Santa Maria sopra Minerva. The vast majority of heretics chose to abjure and repent rather than die, and this of course is what the church preferred, even in the sixteenth century, since restoring faith was a more powerful and persuasive message than executing the unorthodox. Bruno never recanted his beliefs. The Holy Office, under the leadership of the deeply learned and pious Cardinal Robert Bellarmine, declared him a relapsed heretic. Tongue bound or possibly pierced to prevent him from speaking, stripped naked and formally defrocked as a Dominican–he had been excommunicated from this order for almost twenty-five years at the time of his death–Bruno was burned on a pyre in Campo de’ Fiori. Just as today the rainbow-colored flags of peace hang from many Roman windows to protest the war in Iraq, on that second Sunday of June in 1889, while good Catholics celebrated Pentecost, Campo de’ Fiori was festooned with flags bearing Masonic symbols. Fiery speeches were made by politicians, scholars and atheists about the importance of commemorating Bruno as one of the most original and oppressed freethinkers of his age. The spirit of the tribute reflected the fact that the idea of honoring Bruno by erecting a statue in the very piazza of his immolation was not simply a Roman or even an Italian project. Nineteenth-century philosophers like Hegel rediscovered Bruno’s writings on the unity of truth and began to regard him as a forgotten forefather. Bruno’s early advocacy of the Polish astronomer Nicolaus Copernicus’s idea of a heliocentric universe–the subject that precipitated Galileo’s trial and condemnation in 1633–also inspired a misguided interpretation of Bruno as a martyr for science. The international committee that supported the installation of Bruno’s statue included luminaries of science like Ernst Haeckel and Herbert Spencer, and leading literary figures like Victor Hugo and Henrik Ibsen. All of them saw the commemoration of Bruno as a symbolic victory for reason and progress. After a day of prayer and fasting, Pope Leo XIII responded with his own interpretation of Bruno. He told the faithful that he considered the man from Nola, a small town east of Naples, to be a willfully unrepentant materialist and pantheist–in short, the embodiment of everything that sought to destroy or diminish the church. No nation that enshrined such a man could represent the Catholic vote. Indeed, two years earlier, when a summary of Bruno’s trial had unexpectedly surfaced in the Vatican archives, Leo XIII hid the document. He actively wanted to avoid the kind of controversy that had occurred when the followers of Mazzini, having taken control of the Vatican in 1849, threw open the archives of the Roman Inquisition, symbolically liberating centuries of heretics trapped inside its documents. The surviving–and frustratingly incomplete–documentation of Bruno’s trial emerged and was published in 1876. Interpreting these materials became part of the epic struggle between the Roman Catholic Church and its detractors. Leo XIII, a judicious pope whose encyclical Rerum Novarum is one of the foundational documents of twentieth-century Catholicism, was in many respects an open-minded leader who struggled mightily to restore the papacy’s tattered reputation. But he did not want further discussion of Bruno to destroy what he was trying to mend. He took the bold step of opening the Vatican archives to researchers, but he also put Bruno’s trial summary aside, probably in his personal archive. A later prefect of the Vatican Library, Cardinal Angelo Mercati, rediscovered it in 1940 after a fifteen-year search. By then the vexed question of the Italian state’s relationship with the church had been resolved by the mutual diplomacy of Mussolini and Pius XI. Though a single document had remained hidden for centuries, there was no repressing the sentiments that the figure of Bruno inspired. Following Leo XIII’s statements condemning Bruno and his latter-day admirers on June 30, 1889, the Giordano Bruno Society subsequently opened an office a short walk from St. Peter’s Square to taunt the Pope with its banners. Politicians were heard to shout “Viva Giordano Bruno!” on the floor of Parliament as the battle cry of a new nation. Every February 17, modern-day Brunisti celebrate his audacity, his capacious intellect and his obstinate refusal to capitulate to religious orthodoxy. They gather in front of his statue, not far from where he met his grisly end, to pay homage to him as a visionary, philosopher and freethinker. For all these reasons, we too should pause before this monument to one of the most troubled minds of the Renaissance to ask ourselves: who was Bruno, and what did he do to inspire such divided views of his legacy? Ingrid Rowland’s Giordano Bruno: Philosopher/Heretic is an excellent starting point for anyone who wants to rediscover the historical figure concealed beneath a cowl on Campo de’ Fiori. Her lively and learned biography removes Bruno from myth and polemic, where he has so often resided, and restores him to the time and place that inspired his dual passion for knowledge as well as faith. She also offers a far richer and multidimensional account of Bruno’s peculiar and complex intellectual itinerary than earlier scholars like Frances Yates, who, in her brilliant and influential account Giordano Bruno and the Hermetic Tradition (1964), depicted him as a great Renaissance magus. She inspired a generation of readers to see him primarily as a Hermetic philosopher devoted to the restoration of Egyptian wisdom. Generously acknowledging the more recent work of Bruno specialists like Hilary Gatti, who have shown us how to read his politics, philosophy, science, plays and poetry seriously, Rowland describes how Bruno became the kind of person who fascinated and alarmed virtually everybody who came into contact with him. She takes us inside his head to see the interplay of theology, philosophy and poetry that shaped his worldview. The son of a gentleman-soldier from Nola, the young Filippo Bruno took the name of Giordano when he entered the Dominican order in Naples at age 17. Even during his youthful initiation into the mysteries of faith, Bruno seems to have had his doubts. He reportedly stripped his monastery cell bare of all but a crucifix. He later recalled that he had doubted Christ’s divinity. But he was intoxicated by the teachings of the church: its great libraries filled with pagan and Christian learning, its charismatic preachers and its appreciation for young men of talent. At 21 Bruno was called to Rome to recite Psalm 86 in Hebrew, forward and backward, for Pope Pius V. He was well launched onto the road to ecclesiastic preferment. Eventually, however, Bruno’s outspoken beliefs caught up with him. In 1575 he fled Naples as rumors about his unorthodox religious beliefs spurred an investigation by his order; he left behind his life as a Dominican–along with a copy of one of the banned commentaries of the Dutch humanist Erasmus in the monks’ latrine. Concerns about his heretical denial of the Trinity led Rome to summon him to appear before the Inquisition in 1576. Bruno instead took to the road, an ex-friar in a search of a new life. He would not return to Italy until 1591. The path Bruno blazed lay at the crossroads of several concurrent movements. The Renaissance expanded the world of texts and transformed them into printed books, ever widening the domain of knowledge for hungry minds like Bruno’s. The splintering of Christianity ushered in by the proclamations of Luther, Calvin and many other reformers had slashed a deep wound in the heart of the Roman Catholic Church. Fundamentally, the Reformation raised the question of how to choose among multiple versions of faith. Nothing less than loyalty to the doctrines and institutions of the church was at stake. Every question Bruno asked of his faith led him further away from its center. Finally, important changes in how to understand the natural world–indeed, how to conceive of knowledge itself–were gradually reshaping mankind’s understanding of the universe. Bruno was among the first generation of thinkers to contemplate at length the implications of the Scientific Revolution. A product of the age of Copernicus, he was nonetheless a witness and, for some, a prophet of the era of Galileo. Rowland aptly describes Bruno as having led a picaresque life. He wandered from one city to another in search of employment and a better faith while he honed his philosophy. In Geneva he temporarily became a Calvinist and was subsequently excommunicated. In Toulouse he found employment as a professor (we can suppose that they did not check his credentials in Rome). Inevitably, he dreamed of great success in the capital cities of Europe. By 1581 he was in Paris attempting to teach King Henry III and his courtiers one of the many secrets he claimed to possess: the ancient and mysterious art of memory that could enable one to recall knowledge from a series of simple images, symbols and words. It was in this period of his life that Bruno began to publish, calling himself the “Nolan, the Academic of no Academy.” Subsequently Bruno traveled to London, where, Bossy’s delightful account of him as a spy in the French ambassador’s household in his Giordano Bruno and the Embassy Affair (1991) notwithstanding, he seems to have been primarily a philosopher without a country. The English laughed at his thick accent when he lectured at Oxford in the summer of 1583. They found his description of Copernican astronomy utterly incomprehensible. He was just a funny little man from Nola. Bruno’s failure to gain an appreciative audience in person spurred him to put his cosmology on paper. He wrote furiously in the ambassador’s house on Butcher Row, offering an allegorical critique of Rome in his Expulsion of the Triumphant Beast and composing strange and acerbic Italian dialogues, like The Ash Wednesday Supper, that vindicated his humiliating experience before the Oxford dons by explaining the promise of the new cosmology through the eyes of the Nolan. As Rowland observes, building on the crucial work of Gatti’s Giordano Bruno and Renaissance Science (1999), Bruno went far beyond what Copernicus had intended in replacing the earth with the sun as the static point in the universe. Because of the new astronomy, he began to consider the infinite in all of its dimensions. He envisioned a universe populated by many worlds, without center and without end. Bruno also attempted to address a central problem that Copernicus and his editors had been unable to resolve: how to consider the new cosmology in light of scriptural accounts of nature. Famously anticipating Galileo’s argument, he suggested that science and faith were two different but complementary kinds of truth, since each had its own language that was appropriate to its intent. Had his books enjoyed a somewhat wider readership than they seem to have gained–it took the Roman Inquisition several years to acquire even a portion of his publications when it decided to assess them as part of his trial–his argument about complementary truths might have been important. Rowland’s biographical approach to Bruno allows us to see the development of his ideas more clearly in relation to far more personal goals. In Paris in 1585, Bruno’s intellectual pride and irascible temperament quickly led him into a series of vitriolic academic quarrels that did little to improve his chances of finding a new position. He continued his exploration of infinity by writing a lengthy Latin poem on this subject. And he began to consider the possibility of reconciling with his church. Preliminary inquiries, however, reminded him of the difficulties he would face. He might have to answer questions about his leave-taking and subsequent activities that he wished to avoid. Still, the image we are left with is that of a man who had surveyed the religious scene in Northern Europe–Calvinist and Anglican–and not yet found a religion he preferred to his own. In 1586 Bruno left Paris for Germany. He found himself in the heart of Luther’s Reformation, and not exactly welcome in its universities. After failed attempts to secure a teaching post in three different towns, he arrived in the more tolerant city of Wittenberg to a somewhat warmer reception. A new series of lectures and publications ensued. Bruno boldly invited listeners to discard everything they thought they knew about how to learn. Doubt knowledge, then find your philosophy, he proclaimed. He offered himself as a seer, calling his books “lamps” to guide the uninitiated on the new path toward wisdom. Yet by the time he developed these ideas, Bruno was on the road again. The old prince had died, and his son was far less open to employing professors of suspect faith. Bruno headed for Prague and the legendary court of Rudolph II, who collected interesting minds of all kinds–including Kepler, one of Bruno’s most perceptive readers, who arrived there in 1600 after his own religious troubles elsewhere. Rudolph was sufficiently intrigued by Bruno to meet him, but no job was forthcoming. The Nolan continued to travel throughout Germany–first to Tübingen, then Helmstedt and Frankfurt, famous for its international book fair–publishing steadily along the way and perfecting his ideas. It is not clear if he actually converted to Lutheranism at this stage, but he became more openly critical of the papacy. A Helmstedt pastor excommunicated him in 1589. Bruno was a man who had tried all religions and been satisfied with none (nor they with him). But he was increasingly proud of his philosophy. In a series of Latin poems written in 1591, he boldly called for a new logic and a new metaphysics, a radically new system of knowledge to accommodate his vision of the cosmos (a vision later dubbed “The Acentric Labyrinth”). He also began to think about the infinitely small, or the “monad,” as the natural complement of infinity. In a different guise, this concept would become the centerpiece of Leibniz’s philosophical system in the next century. Rowland skillfully shows us how Bruno developed this idea from his reading of ancient and Renaissance philosophy and used diagrams to convey what neither words nor his more limited mathematical abilities could indicate. One of the greatest mysteries of Bruno’s life concerns his decision to return to Italy in 1591. Why did he take such a risk? In part, as Rowland suggests, he made a calculated move by entering the Venetian Republic, which was known to be religiously tolerant and even antagonistic to Rome. In part, he may have been simply tired of wandering and hopeful that he could finally resolve his troubled relationship with his faith. He briefly taught mathematics at the University of Padua–in an ironic twist of fate, just before the Venetians succeeded in wooing Galileo away from Pisa. He explored the possibility of a papal pardon with an old acquaintance from his days in the Dominican college in Naples. And he made the mistake of giving lessons in the art of memory to a prickly Venetian named Giovanni Mocenigo, who denounced him to the Venetian Inquisition in 1592. Rowland’s interesting reconstruction of the next eight years of Bruno’s life–seven of them spent in the Roman Inquisition’s prison–helps us to see how slowly and deliberately the wheels of justice ground. Despite Bruno’s efforts to repent, the Inquisitors were not convinced that he was sincere. While reports of his beliefs were scanty and largely speculative–with hindsight we know far more than they did–his actions were most suspicious. Why had he spent so many years in Protestant countries and published all of his books outside the mechanisms of Catholic censorship? Why hadn’t he made more concerted efforts to confess and repent earlier? There were nagging concerns that the skinny little black-bearded man from Nola might indeed be just as the Frankfurt book dealers had described him to some Venetian printers: “a man without religion.” And, more to the point, what exactly was in those books? The lacunae in the trial documents permit only a provisional reconstruction of the final stages of his trial. Cardinal Bellarmine distilled a long list of potential problems into eight accusations of heresy. Bruno had earlier confessed to eating meat on fast days, traveling in Protestant lands, listening to Protestant sermons and reading forbidden books. (One wonders whether he came clean about leaving a volume of Erasmus in the latrine.) He further denied that carnal sin was a mortal sin. None of these issues would have led him to the sentence he eventually received. Part of the enigma of Bruno lies in the documents we do not have and in the intriguing possibilities of those that have survived. With a detective’s eye, Rowland shows us what the evidence might suggest. Bruno’s denial of the Trinity and Christ’s divinity were grave issues indeed. His fascination with multiple worlds and his understanding of the soul were also topics under discussion by the Inquisitors, though we do not know what their final judgment was of his beliefs on these specific issues. The fact that he had allegedly practiced the art of divination raised questions about to what extent he wished to supplant God’s powers with human agency. Bruno argued that these were philosophical questions and not matters of faith. But it is unlikely that this distinction convinced the Inquisitors that his faith was pure. We do know that the final judgment rendered by Rome accused Bruno of denying the miracle of the Eucharist. No doctrinal issue was more contested between Catholics and Protestants than the question of whether the liturgical re-creation of the Last Supper was a real miracle, a partial miracle or a symbolic meal. Bruno had denied the accusation in Venice, but it persisted in Rome undoubtedly because other evidence that we can no longer see in its entirety–possibly including their reading of his Ash Wednesday Supper–persuaded the Inquisitors to take it seriously. Bruno had a lot to say throughout the trial, but at a certain point he refused to talk further with his Inquisitors. The only judgment he was willing to entertain was that of the Pope, who had no desire to intervene on his behalf. Bruno, in turn, refused to recant the eight accusations. Spurning numerous offers to abjure his beliefs and refusing even the final consolation of gazing at the crucifix, Bruno is said to have darkly proclaimed: “You may be more afraid to bring that sentence against me than I am to accept it.” He met his end as a willing martyr to his beliefs. Bruno embodied the kind of challenging thinker to whom the Roman Catholic Church had no satisfactory response in the age of the Reformation. It can be hard, in retrospect, to understand exactly what was at stake at the end of the sixteenth century, especially when so many modern accounts of him are colored by our perception of the zones of potential conflict between knowledge and faith, and by our view of dissent as freedom of speech, a civil right in a democratic society rather than an expression of disbelief in a world in which there is no formal separation between church and state. Rowland’s sympathetic and well-informed portrait of Bruno presents him as far more of a pragmatist, perhaps even unintentionally, than earlier histories have suggested. Her Bruno is not a naïve idealist but a man of ideas running out of options–someone who had, perhaps, put all the words that he could muster onto paper and finally chose to have the denouement of his philosophy, and its implications for faith, occur in front of his Inquisitors. Rowland concludes her study of Bruno by recounting the many ways his style of writing and modes of thinking persisted beyond his lifetime–in evocative passages in Shakespeare, in the fantastic visions of Kepler and especially Athanasius Kircher, and in the witty prose of Galileo’s great and controversial Dialogue Concerning the Two Chief World Systems (1632). Rowland’s Bruno continues to be a somewhat curious heretic: a man who questioned many things without openly denying faith, and who may indeed have sacrificed himself for principles as much as for beliefs. Barring the reappearance of any material about him among the archives spirited away from the Vatican by Napoleon’s troops in 1810, the full details of Bruno’s heresies will continue to remain a mystery. Isn’t that the way he would have wanted it?